Two silver-hued aluminum arms extend from the base of the ambiently lit 34” display, welcoming you to the world of curve. Finding the sweet spot for such a large display can be challenging, which is why it’s ergonomically-designed for tilt, swivel* and height adjustment. The ZeroFrame™ design, while ideal for a multi-monitor set up, rids the display of bulky bezels for more viewable screen and less obtrusive borders. We’ve pushed the screen to its limits to achieve a 1900R* bend. AKA , the lower the “R”, the greater the curve, the further the immersion. 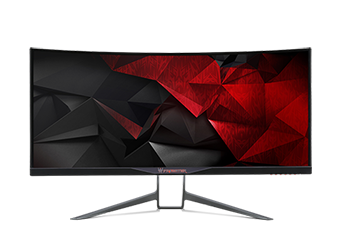 IPS panels are known for two things: great color accuracy and being viewable from up to 178°. With an UltraWide display, these things are paramount. On the off chance you don’t have speakers or a headset; we’ve got you covered with two powerful 7-watt speakers.